The question of what it means to be human surfaces time and again in periods of important technological change. As if, once detached from the labor of their creation, technologies then take on the capacity of philosophical anthropologists: signaling to us, undeterred by their own non-humanness, that the fact of their existence solicits a clear definition of human nature. 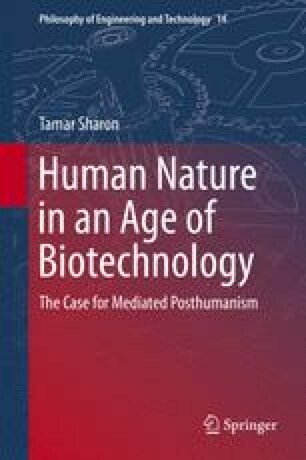 In our current technologized culture, where the life sciences themselves are increasingly merging with technology in the form of reproductive, genetic and neuro-technology, the question of what it means to be human has taken on a new urgency. Bostrom, N. (2002). Existential risks: Analyzing human extinction scenarios and related hazards. Journal of Evolution and Technology, 9(1). http://jetpress.org/volume8/symbionics.html. Accessed 20 August 2013. Bostrom, N. (2003). The transhumanist FAQ, Version 2.1. http://www.transhumanism.org/resources/FAQv21.pdf. Accessed 6 June 2013. Carrico, D. (2006). Technoprogressivism: Beyond technophilia and technophobia. http://ieet.org/index.php/IEET/more/carrico20060812/. Accessed 14 Jun 2013. Hughes, J. J. (2002). The politics of transhumanism. http://www.changesurfer.com/Acad/TranshumPolitics.htm. Accessed 6 June 2013. Wolfe, C. (2010). Posthumanities. http://www.carywolfe.com/post_about.html. Accessed 7 Mar 2011.